This is of our first installment on our new section here at Ultra 5280. You will see more films and movies being reviewed by our house expert Ian Beavers who has a unique rating system for those of you that remember. I will give you minute to come up with as many time-related puns as possible. GO! How many did you come up with? Probably in the neighborhood of five or so? And I bet you could double that number if you really put your mind to it, right? So we’ll call it ten. In Time somehow managed to pack in six times that amount within the first thirty minutes of the film. Okay, I’m exaggerating, but packing in the puns is more annoying than it is effective and that really ends up being the first big failure during In Time. The concept, if you haven’t yet heard, revolves around the usage of time as currency in the near future. In this world, everyone has been genetically altered to live until the age of twenty-five, at which point each person is faced with death unless they work to fill their clocks, which is represented by a countdown readout on their forearms, rendering the rich immortal. The concept itself is quite intriguing, which led me to see the film, and while Justin Timberlake isn’t necessarily the best actor he's a decent entertainer. Sadly though, his performance in this film fell flat, as did the bastardized story of Bonnie and Clyde that occurs. The potential for an action film existed, it just wasn't executed well. 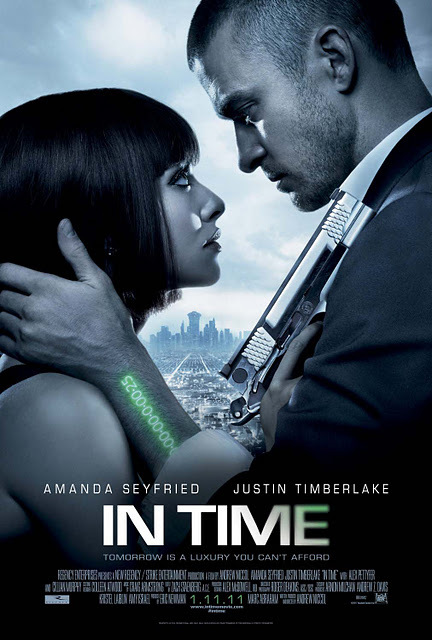 To sum things up, In Time was a bit of a let down I give it the Ultra rating of Flick 4.